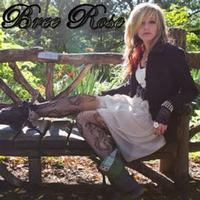 Bree Rose is a very talented young lady. The songs presented here are all very well written. In general they fall somewhere in the range of the European epic metal sound. Her singing is quite strong. The only real issue here is the production, which at best feels a little too polished. At its worst points it feels far too sterile and searching for a real contrived pop sound. That wouldn’t be a problem if Rose were one of the sea of talentless pop stars out there. She’s not. She is talented and as such deserves a more authentic and less artificial production. It’s a real tribute to her talent that this is still strong despite some over-production. There’s a major hard edged intro bit. Then the vocals power in to move it forward. This has a nicely heavy sound that’s in keeping with the epic metal sounds that seem so big in Europe. The vocals are strong, but seem a little over-produced. Of course, that kind of production is really a part of the sound in a lot of ways. The guitar sounds on this are awesome. There’s still some of that epic metal texture on this tune. It’s got more of a pop punk feeling to it, though. While I like this one, it’s definitely over-produced and too blatantly poppy. The song itself and vocal delivery are both strong. This is just too generic in production and seems to be trying to hard to fit into the modern pop sound. While this cut is even more pop-oriented in a lot of ways, the production has more of a real metal feeling to it. That makes this one a step up from the one that preceded it. This one feels much more like the standard pop fare on the radio. That said, though, it’s got considerably more meat on its bones than most pop music. It would be great to hear this with a less heavy hand on the production. The song itself is quite strong. The production just takes into rather generic territory. With lots of keyboards and symphonic elements, this is a cool tune. It fits into that epic metal style, particularly when it powers out later. Still, it would be at home on pop radio these days. There’s a smoking hot guitar solo in the midst of this.